Hot on the heels of Black Sheep Restaurants' superb New Punjab Club comes Osteria Marzia – the group's 16th venue following on from the likes of Ho Lee Fook and Carbone – serving coastal Italian cuisine courtesy of chef Luca Marinelli, on the ground floor of The Fleming hotel ­­– which has had a rather snazzy refurb. The restaurant is decked out in aquamarine blues, teakwood furnishings and white bamboo panels offering a subtle nautical theme without going overboard. Our favourite features are the hanging spherical lanterns and street view windows that contribute to the spot-on ambience. 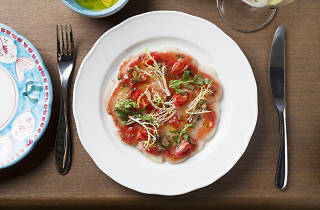 Aside from awkward seating – the place feels a little cramped for a 50-seater – Osteria Marzia delivers the gorgeous aesthetic, high-level execution and polished service we’ve come to expect from Black Sheep Restaurants. Unfortunately, the food isn’t of the usual top standard. We’re not saying it’s bad by any means, but it is very hit and miss. 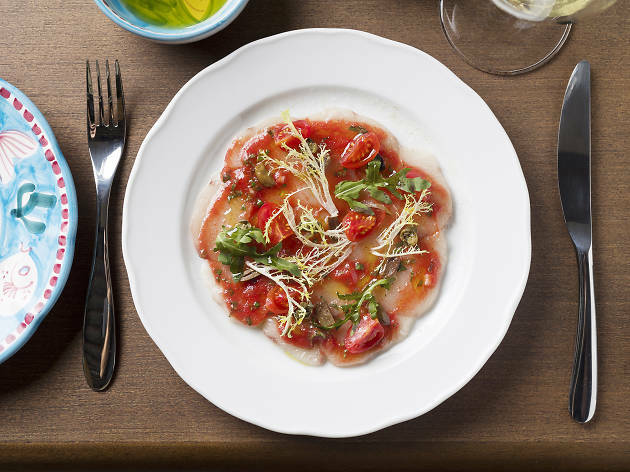 Proceedings begin with the hamachi crudo with cherry tomato, olive and basil ($178) and it’s a good start. The plump, tender slices of hamachi belly are lightly seasoned, with the basil adding some much-appreciated fragrant notes, but we can’t help but laugh at the chintzy blue fish patterned plates the food is served on. We’re sure it’s meant to be cute, but it borders on tacky. For mains, we opt for the chitarra pasta with Boston lobster ($248) and tuna Maremma with panzanella salad ($388). The chitarra is perfectly al dente and its freshness radiates, but the same cannot be said for the lobster, as it’s briny taste and less-than-firm texture betrays its lack of freshness. The chunk of tuna belly atop the panzanella salad isn’t the most attractive looking dish but luckily, it’s a generous slab and our knives cut through it like butter. It’s pleasantly fatty, delicately seared and melts in our mouths, but is severely let down by the panzanella salad. The chunks of bread straddle the unsettling void between soggy and stale, spiked by overtly bitter and metallic tomato, which overpowers the tuna, so we shun it. We finish off with the coffee gelato fiordilatte ($88). Not usually one for coffee desserts, there’s a rich and robust roasted coffee flavour that’s complemented by the smooth, creamy texture of the gelato. Finally, a coffee dessert we’re sold on. Osteria Marzia is a rollercoaster of hit and miss. For the price tag, we expect consistency and though overall it's a decent feed, we can’t really see ourselves returning.